The kereru is a large bird endemic to New Zealand, usually found in forested areas throughout both the North and the South Islands. With iridescent green and bronze feathers on its head and a white chest the kereru are usually easy to spot because of their size and the noisy beat of its wings when flying. Kereru are large birds and can measure up to 51 cm from tail to beak, and weigh about 650g. Since the extinction of the moa, the kereru and parea are now the birds with a bill big enough to swallow large fruit, such as those of karaka, miro, tawa and taraire. The disappearance of these birds could be a disaster for the regeneration of our native forests. Long-lived birds that breed slowly. They nest mainly in spring/early summer producing only one egg per nest, which the parents take turns to look after during the 28-day incubation period. Kereru numbers are sadly in gradual decline through habitat loss, predation, competition and illegal hunting. Although the kereru was traditionally hunted for its meat and feathers, hunting kereru is now illegal. 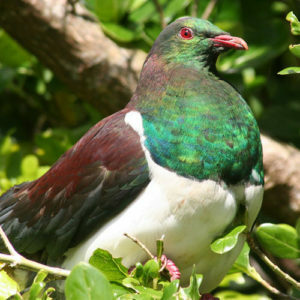 The most serious threat to the kereru comes from predators such as rats, stoats, cats and possums whom eat their eggs and young.